Sessions new instructions were met with hostility from former Obama administration Attorney General Eric Holder, who criticized sessions memo calling it "unwise and ill-informed" saying that these actions will “take this nation back”. Holder went on to say, "The policy announced today is not tough on crime. It is dumb on crime. It is an ideologically motivated, cookie-cutter approach that has only been proven to generate unfairly long sentences that are often applied indiscriminately and do little to achieve long-term public safety." 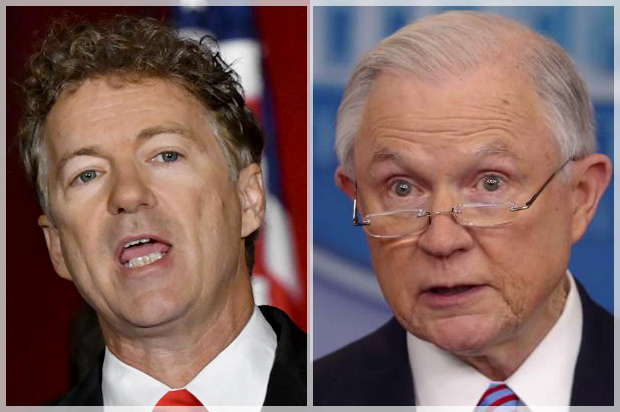 Rand Paul has been one of the GOP’s biggest critics of the Attorney General's Nixonian approach to drug abuse saying that “If I told you that one out of three African-American males is forbidden by law from voting, you might think I was talking about Jim Crow 50 years ago. Yet today, a third of African-American males are still prevented from voting, primarily because of the War on Drugs. The War on Drugs has disproportionately affected young black males.” Sessions is no stranger to these facts, stating in his May 12 press conference that “It is not our privileged communities that suffer the most from violence” and that “Under President Trump, this Department of Justice will have your back”. But It was this draconian approach to drug abuse that sent Weldon Angelos a 25-year-old father of two behind bars, sentenced to a 55-year mandatory minimum sentence for selling a few pounds of marijuana while carrying a firearm, a sentence which his own judge declared as cruel and unusual. Unfortunately millions of Americans are facing the same situation, fortunately for Weldon, he was released in 2016 after a federal court granted him a reduction in sentence. Many supporters of Paul were shocked when the Senator voted to confirm Sessions as Attorney General in early February. But we now know that Sessions may not have fully disclosed his intentions to the Senator. In an interview with Rare, just four days after Sessions released the two-page memorandum, Sen. Paul said, "I spoke with Sessions last when he was up for nomination, which makes this move by him even more disappointing now because it was different from what I was led to believe"
"Since mandatory sentencing began, America's prison population has quadrupled, to 2.4 million. America now jails a higher percentage of its citizens than any other country due to mandatory minimum sentences. These sentences disproportionately affect minorities and low-income communities, while doing little to keep us safe. The federal government should get out of the way, and allow local and state judges to do their jobs. We must work hard in a bipartisan fashion to change these laws," Sen. Paul said. Rand Paul and Brian Schatz (D-HI) reintroduced the Reclassification to Ensure Smarter and Equal Treatment (RESET) Act (S.1252) on May 25th. This bipartisan legislation would reclassify specific low-level, nonviolent drug possession felonies as misdemeanors, eliminate the distinction between crack and powder cocaine for sentencing, and ensure that food products containing drugs are weighed fairly. This RESET Act is in the first stage of the legislative process. It will typically be considered by committee next before it is possibly sent on to the House or Senate as a whole.